This set of Machine Kinematics Question Bank focuses on “Types of Belts – 2”. Explanation: For uniform loading it is better to change the complete set of V-belt drive. 2. In a multiple V- belt drive, all the belts should stretch at the same rate. Explanation: It may be noted that in multiple V-belt drive, all the belts should stretch at the same rate so that the load is equally divided between them. 3. The ratio of the driving tensions for V-belts is _____________ times that of flat belts. 4. The ratio of driving tensions for rope drive is same as that of V-belt drive. Explanation: In a high speed flat belt transmission, it would probably help. It is unlikely to add any significant power transmission in V- belts, as they rely on the wedging action of the belts in the pulley grooves. As the need for greater power transmission increases in a V- belt drive, the belts wedge harder into the pulleys, to respond. 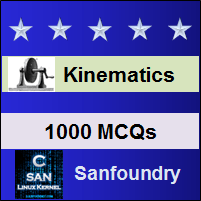 To practice Machine Kinematics Question Bank, here is complete set of 1000+ Multiple Choice Questions and Answers.